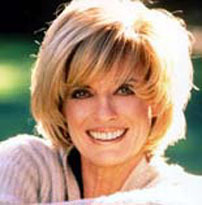 Linda Gray is a soap opera actress, playing Sue Ellen, wife of J.R. Ewing (Larry Hagman) on Dallas; Hilary Michaels (Heather Locklear's mother) on Melrose Place; and Priscilla Kelly on The Bold and the Beautiful. She never won an Emmy, but her performance on Dallas won Gray a Bambi and an Il Gato, the German and Italian equivalents. As originally written, her "Sue Ellen" character on Dallas had little to do or say beyond asking guests if they wanted cream in their coffee. "For two years, I was always in the back," she has said. Eventually, though, her sparring with J.R. became a recurring high point on Dallas, with arch dialogue. The actors' friendship lasted many years after Dallas was cancelled, but their on-screen fights were based on backstage reality, fueled by Hagman's alcoholism. He was known to consume up to four bottles of champagne in a day. In 1967, while Gray was working as a model, she posed for a close-up of her stocking-clad legs, a photo which was used in promotional posters for The Graduate, in lieu of Anne Bancroft's less photogenic legs. In 2002, she played "Mrs. Robinson" in the Broadway production of The Graduate, for one week, while Kathleen Turner was on vacation. Gray now serves as a goodwill ambassador for the United Nations, and says, "My role is to meet people, listen to what they have to say and see what we can do to help." In this capacity, she has visited Nicaragua and India. In a 2005 trip to Thailand, she met with the Dalai Lama and dined with Deepak Chopra.